When it comes to moving, there are parts of the process that are exciting and parts that are just overwhelming. Preparing to start over in a new home, learning your way around a new town and making new friends is exhilarating for some people. Others embrace the opportunity to clean out their existing home and re-evaluate their accumulated possessions, making choices on what should stay and what can go, and sometimes rediscovering long-forgotten items in the process. For many people, however, the prospect of moving is one filled with dread. No matter which category you fall within, Zippy Shell Greater Columbus can make your move easier and far more enjoyable. 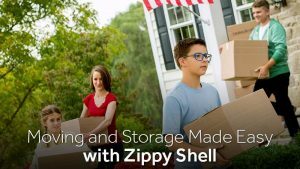 What Does Zippy Shell Offer? Zippy Shell is not just a moving company, although we can complete most aspects of your move, including packing and loading services. We are also not just a storage company, although that is a service that we offer. We drop off one or more portable storage units at your home or business. Then, you fill it up with your furniture, boxes and other items. Once you are finished loading the containers, we will come back and pick them up. We can hold your containers in our secure, climate controlled warehouse facility, or deliver them directly to your new home. Then you simply unload the containers and let us know when you are ready to have them removed. What Is The Zippy Shell Advantage? When you use Zippy Shell to complete your move, you don’t have to go through the hassles of renting a moving truck and transporting items from one location to the next. As compared to hiring a full service moving company, we are confident that you will find our pricing far more budget-friendly. As we all know, packing all those boxes and tubs takes the most time. By loading and unloading the containers yourself, you can save a lot of money over hiring movers. Depending on the size of your move, or your desire to pace yourself, we offer 1-day, 2-day or 3-day moves, giving you more flexibility and time to move. Once you’re loaded, give us a call, and we will transport your Shell to your new home, using the remainder of your selected time to unload at your own pace. Storage and moving, that makes life simple! Our customers report high levels of satisfaction with our service and professionalism. We understand that moving can be stressful, and we are here to help. By choosing to let Zippy Shell assist with your next move, you will have more time to handle other important moving tasks and to have some much-needed downtime as you check items off of your moving to-do list. We feel confident that once you see the Zippy Shell system at work, you won’t want to go back to traditional moving options. The team at Zippy Shell Greater Columbus is standing by to assist you with any questions that you may have. Feel free to contact us for a quote on your next move, or on various storage options. We are always here to help, and we look forward to helping you solve your storage and moving challenges.